This is an all-levels class that will leave you feeling free and light. The class starts with a warm-up on your yoga mat including stretching and sun salutations. The hammock is used as a prop to help you work through a series of standing postures, planks, and inversions allowing you to build heat, strength, and flexibility. Class concludes with savasana in the hammock for a truly blissful experience of being wrapped in silk, feeling safe and fully supported. Come experience the fun and freedom of aerial yoga! 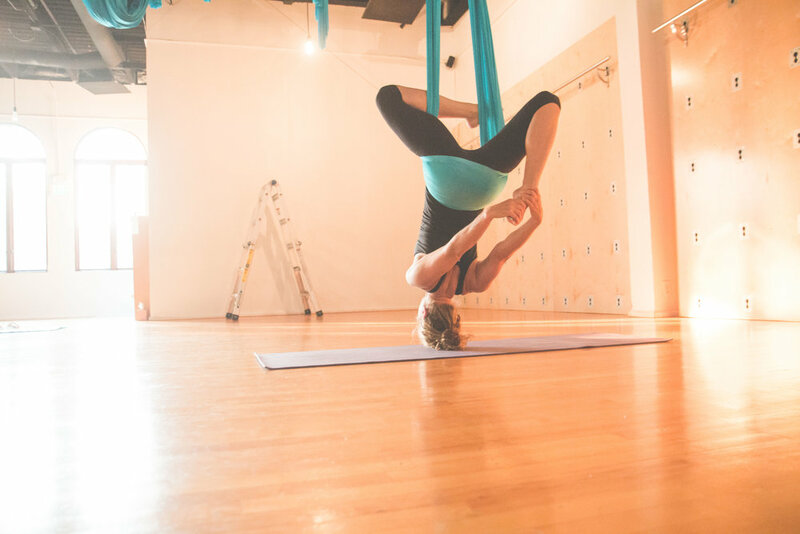 In Aerial Yoga, a hammock is used as a prop similar to a block or a strap. Using a hammock allows you to explore in your yoga practice. If you are challenged by a traditional asana, the hammock will support you, allowing you to reach the asana expression in the air. For advanced practitioners, the hammock can offer new depths and make postures more challenging. The hammock is also a spotting device for inversions, helping decompress the spine and relieve pain and swelling. CLASS SIZE IS LIMITED. So, please reserve your spot ahead of time by booking through our schedule online, the Mindbody app, or by calling us at the studio (805) 598-7100. If you can't make it, please let us know at least 12 hours in advance or a $10 cancellation fee may apply.